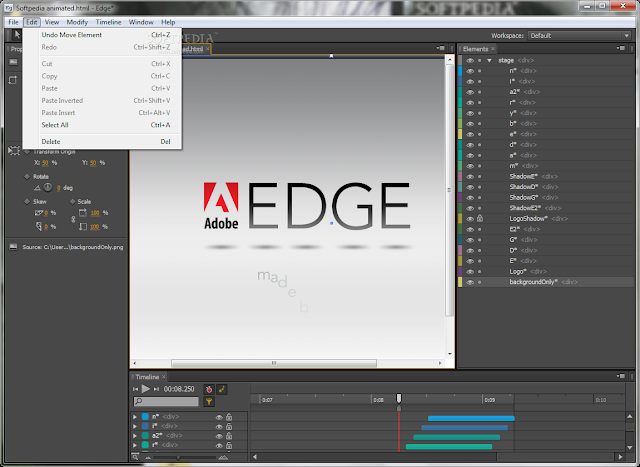 Adobe Edge: Is it the end of Flash? Animation on the web is easier than ever! Adobe has always been on top of new emerging technology. HTML5 and CSS3 are still new programming languages. They are both currently under development. Not all browsers support every aspect of HTML5 and CSS3 yet. Adobe Edge makes it easier for designers (and even non-designers) to create interactive websites without the use of Adobe Flash. Some professionals believe Edge will be the end of Flash. Personally, I do not think that is an accurate assumption. HTML5 makes animating items on the web a lot easier, but it does not do everything Flash can do. Flash is such a complex program; I believe it would be impossible to include everything in HTML5. Or is it? For those of you who have created things in Flash, the interface looks similar doesn’t it? Adobe always does such a great job making the interfaces of their programs look similar. This makes it easier for developers to move from one program to another with very little training. You can also download the most recent Adobe Edge Preview via Adobe. As stated before, HTML5 and CSS3 are still in the development stage. This also means that Edge is still not 100% complete. Who knows how advanced it will become in the next year. Do you think Edge will be the end of Flash? Ready to add some motion to your next project? Let TBH Creative do the job for you!